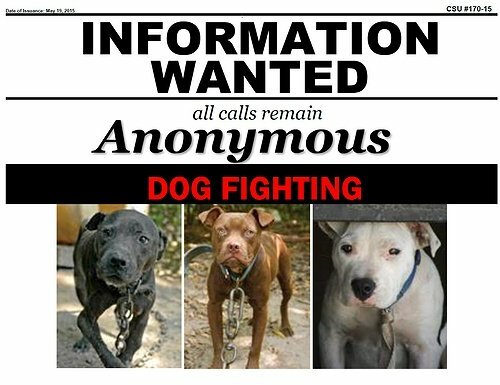 Crime Stoppers and the Nassau County Police Department’s District Attorney’s Squad are seeking the public’s help in connection with any information, regarding any person(s) promoting Dog Fighting in Nassau County. Nassau County, NY - May 19, 2015 - Crime Stoppers and the Nassau County Police Department’s District Attorney’s Squad are seeking the public’s help in connection with any information, regarding any person(s) promoting Dog Fighting in Nassau County. Dog Fighting is a violation of Article 26 of the New York State Agriculture and Markets law. This law was created to prevent cruel and inhumane treatment to an animal that renders them abused, scared, injured, and often dead as a result of their injuries. Crime Stoppers is asking anyone who has any information regarding this crime to help prevent cruelty to animals by calling our toll free hotline at 1-800-244-TIPS (8477). Subject: LongIsland.com - Your Name sent you Article details of "Nassau County Crime Stoppers Seeking Information Related to Dog Fighting"